Background: Recent studies have shown improved outcomes following laparoscopic colorectal surgery when compared to open laparotomy for the operations of benign and malignant colorectal diseases, including inflammatory bowel disease (IBD). The aim of this study was to evaluate the results of laparoscopic colorectal resections in normal weight patients compared to overweight and obese patients with IBD. Methods: After IRB approval, a retrospective analysis of a prospectively accrued surgical data-base was performed. 194 consecutive patients with IBD who underwent laparoscopic resections from January 1st 2000 to April 30th 2008 were reviewed. Weight status, surgical technical factors and 60 day post-operative complications were reviewed. Chi square and Student T – tests were used. Results: Normal weight (Group I) included BMI (18.5-24.9 Kg/m2) 117 patients. Group II included overweight BMI (25-29.9Kg/m2) 60 patients and obese BMI (±30 Kg/m2) 17 patients. Crohn’s Disease was diagnosed in 76 (64%) for Group I and 42 (54%) in Group II. 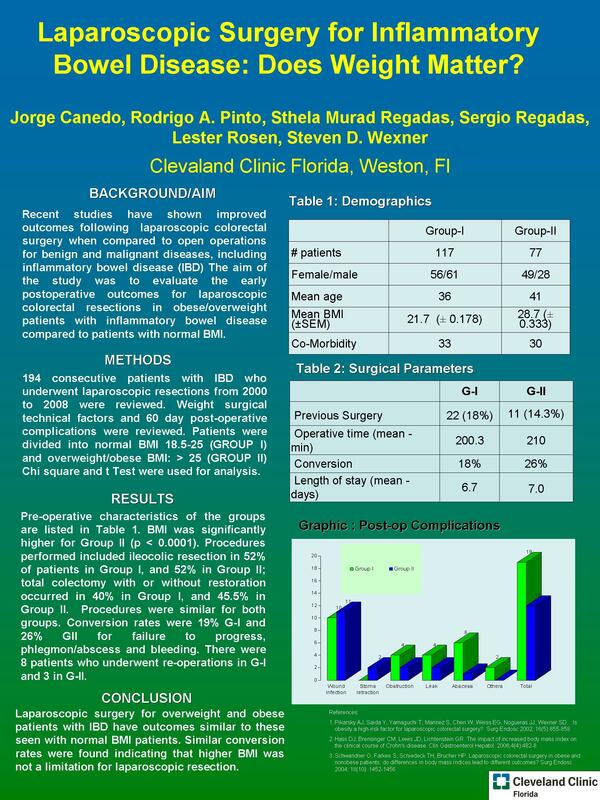 Procedures performed included ileocolic resection in 52% of patients in Group I, and 52% in Group II. Total colectomy with or without restoration occurred in 40% in Group I, and 45.5% in Group II. The conversion rate for Group I was 20% and 26% for Group II (p>0.005, ns). The most common reason for conversion was failure to progress due to adhesions or phlegmon. There was no difference in major postoperative complication rates (wound infection, or abscess, or anastomotic leakage, or small bowel obstruction), or in mean hospital stay (7.0, 6.8, respectively). There was no mortality. Conclusions: There were no significant differences in the rates of conversion, major postoperative complication, or length of stay between normal weight, or overweight and obese patients with IBD. Patient’s weight did not affect outcomes after laparoscopic surgery for IBD.